The proceedings of the Haryana Vidhan Sabha, not that they have been worth emulating in the past, touched a new low today when INLD members and a BSP member virtually came to blows. An ailing health set-up plagued with the paucity-of-staff virus came under the scanner during question hour in the Haryana Vidhan Sabha here today, with health minister Kartar Devi expressing helplessness in dealing with the situation. Special MEd session on whose orders? In a bid to authenticate their recent decision of starting a special academic session of MEd, the Maharshi Dayanand University (MDU) authorities have officially maintained that they had been directed to do so by the Punjab and Haryana High Court. CFLs okay, but what about disposal? There is no light at the end of the tunnel for compact florescent lamp (CFL) users wanting to dispose of any non-working bulbs. The Command Area Development Authority (CADA), Haryana, has decided to implement a scheme to improve the water table in those areas of the state where it has been depleting continuously. In a bid to cover up the wheat scam, in which 200 quintals of the stock meant for prisoners was allegedly siphoned off by officials of the Rohtak jail, the jail administration, instead of taking any punitive action against the officials, has allegedly made up for the missing food stock by accepting the wheat purchased from the market by an official. Despite millennium city Gurgaon leading in the state in the collection of revenue from postal services, the department here is facing crisis in improving the services in the city due to the lack of manpower and better infrastructure. Gurgaon has once again earned the distinction of garnering the maximum revenue from the allotment of liquor shops in Haryana by a draw of lots. Revenue of Rs 124.69 crore was collected through the allotment of 292 liquor shops here today. The CPM today organised a demonstration against the attack on the party office in Delhi allegedly by activists of the sangh parivar. The CPM activists assembled in the local Ambedkar Park and expressed their resentment over the alleged inaction of the central government on this issue. The well-known bartan bazar of Jagadhri remained closed today in protest against the increasing incidents of theft in the market. There are more than 200 shops in the market. Shopkeepers accompanied by other traders gathered at the mini secretariat in the morning and raised slogans against the district administration and the police. A teenager was killed and as many as 31 others were injured when the school bus they were travelling in overturned near the Safidon road bypass here today. The mishap occurred when the bus, which was carrying 45 students, was on its way to the school. A Delhi police inspector and his two children died while his wife was injured seriously when a private bus collided with their car near Jahangirpur village on the Jhajjar-Badli road in the district last night. A student of class I of a private school in Peethrawas village, 8 km from here, Neha (6), was reportedly crushed to death by a school bus on the school premises today morning. Neha was the daughter of Babu Lal of Hari Nagar village near here. Kashmira Singh (40), a resident of Jandwala Jattan village under the the Odhan police station in the district, was killed in cold blood last night by three assailants. According to police sources, an old enmity is reported to be the cause of the crime. The police has arrested Manoj Kumari’s husband Abhey Singh and brother-in-law Jaipal Singh, residents of Neerpur village in Alwar district of Rajasthan, in connection with a case of harassment for dowry. The CBI court today reserved its decision on the bail application of Pooja, wife of Dr Jeevan, an accomplice of the kidney racket kingpin, Dr Amit Kumar, till tomorrow. Pooja, who was lodged in the central jail here after her arrest in the kidney case for alleged complicity in the racket, had moved the court seeking bail since she was pregnant. The proceedings of the Haryana Vidhan Sabha, not that they have been worth emulating in the past, touched a new low today when INLD members and a BSP member virtually came to blows. Hands were raised but before they could reach their targets, timely intervention by certain Independent and Congress members saved the situation from taking an ugly turn. An INLD member, Ramphal Chidana, was named by the Speaker following the shameful incident. The member was escorted out of the House by Marshal. The rest of his colleagues, led by their leader Om Prakash Chautala, walked out of the House in order to “save the House from disgrace,” as the INLD supremo told mediapersons later in the press lounge. Later, Chidana was suspended for the remaining period of the session on a motion moved by parliamentary affairs minister Randeep Singh Surjewala. Earlier, the House witnessed repeated interventions by Congress and Independent members while Chautala was participating in the debate on the motion of thanks on the Governor’s address. The INLD leader rose to speak at 4.31 pm. As soon as he described the address as “uninspiring”, during which, he said, “many members dozed off as suggested by newspaper reports,” Speaker Raghubir Singh Kadian asked him to explain his source of information. Surjewala also objected to what Chautala had said. The INLD leader retorted saying something to Kadian, which was expunged by the Speaker. However, Kadian called Chautala “bekaar ka aadmi,” reminding him that though he had been the Chief Minister for seven years, yet he had not learnt how to speak in the House. INLD members were immediately up in their seats, protesting against the Speaker’s remarks against their leader. They trooped into the well of the House and started raising slogans. Surjewala, agriculture minister H.S. Chatha and Congress MLA from Palwal Karan Singh Dalal criticised Chautala and his colleagues for being “disrespectful” to the chair. Dalal said Chautala had no business to advise the Speaker to get his ears cleaned (“Apne kaan saaf karwa ke aao”). The moment Chautala resumed his speech after 20 minutes of ruckus, Shamsher Singh Surjewala intervened, but he could not be heard amidst noisy protest by the INLD members against his intervention. When Chautala spoke on the loan waiver scheme announced in the union budget, finance minister Birender Singh intervened to clarify certain figures quoted by the INLD leader. Once again, Chautala started to speak on the loan waiver scheme, but to face an intervention by the parliamentary affairs minister, who said instead of appreciating the scheme and giving the UPA its due credit, the opposition was unnecessarily trying to run it down. Chautala said if the government paid remunerative prices, the farmers would not have found themselves in debt-trap. BSP member Arjun Singh intervened and said something to Chautala, which could not be heard in the press gallery. But his remarks provoked the INLD members so much that they gathered around his seat with raised voices. Later, Chautala alleged outside the House that it was a conspiracy hatched by the treasury benches not to allow him to speak. As part of this conspiracy, he said, BSP member wanted to physically assault the INLD members. They alleged that the INLD members had conspired to assault the BSP member, who could be saved only after their intervention. They also alleged that the plan to assault the BSP member was a “reflect of Chautala’s prejudice against BSP and all those who speak for the downtrodden”. It began with a question from Ranbir Singh Mahendra about the sanctioned posts, the availability of staff and the vacancies in the government health centres in Bhiwani. The minister replied that direct recruitment of senior medical officers (SMOs) had been initiated and a requisition for medical officers had been sent to the Haryana Staff Selection Commission. To this, Somvir added that though they were told that recruitment was on, the staff situation in hospitals in his district had showed no sign of improvement. Sumita Singh stated that the trauma centre in her district had no staff and doctors had to be called in from the general hospital to run the centre. To all this, the minister said the only answer on offer was that they were in the process of appointing doctors and paramedic staff and the misery of field hospitals and centres would end soon. Water woes and power crisis from all corners of the state came together in the Haryana Vidhan Sabha and one question led to another. Through it all, power and public health minister Randeep Singh Surjewala made only one submission - that he had not been informed of any problem by the MLAs concerned in writing. He assured the members that he would look into their complaints and answer all their queries if they sent him a written request. Sita Ram Sharma sought a reply to his query on the reduction of power load in Sirsa after the installation of CFLs. He claimed that the public had complained of hiked bills after they had switched to CFLs. There were loads of other questions pertaining to CFLs, their users and disposal. The minister said he could give only feeder-specific data if asked for in writing. Beginning with a question from Randhir Singh about water supply arrangements in two particular villages, many similar questions regarding villages all over the state were raised. Members of the House maintained that tanks and taps installed in homes under the Indira Gandhi Paye Jal Yojana were yet to see water run through on account of frequent power failures. Other members sought to know the number of villages where water was yet to reach. Still others sought replacement of pipes carrying water. After hearing them out, the minister said he would entertain a written query and would reply in the same fashion. The irrigation and PWD (B&R) minister, Capt Ajay Yadav, too, had a lot on hand with the members keen to know the fate of the roads in their district. Sahida Khan wanted to know the number of roads constructed in Mewat since 2005 while Naresh Yadav sought a reply regarding the construction of 10 roads in the Ateli constituency. To all this, the answer of the minister was in the negative. To a question regarding digging work on Ottu Lake, he said the department was aware of the problem of silting and was making provisions to check the same. “In view of the verdict of the honourable high court and observations of the State Admission and Fee Committee, the university has granted provisional affiliation to these colleges to conduct MEd programme and included their names in the second counselling to admit students (as one-time exception) in a special academic session,” says the agenda note of a recent meeting of the MDU Academic Council. However, in the documents furnished by the university authorities to substantiate their claim, there is no such order of the high court. A thorough perusal of the said documents clearly indicates that the court has never directed the university to start a special academic session. On being contacted, the university authorities failed to provide any plausible reason to allow certain colleges to run a special academic session. On further probing the case, it was found that the university conducted an entrance test for admission to MEd (regular) programme in the MDU department of education and other colleges of education affiliated with the university for the academic session 2007-08. The university also organised central counselling for the MEd course from November 19 to 22 for those colleges which had gave their consent. However, some affiliated colleges of education of the university did not give their consent for centralised admissions. Two such colleges - the Dayawanti Memorial College of Education, Pada, Gurgaon (to which affiliation had been granted by MDU, and the Deen Dayal College of Education, Khandewala, Gurgaon (whose case of affiliation was under consideration) - approached the Punjab and Haryana High Court. During arguments on November 17, 2007, the counsel for the university stated that the petitioners could be included in counselling if they gave in writing their willingness to do so. The petitioners agreed to do so and the case was disposed of. The case was disposed of on the same day, while the counselling was scheduled from November 19 to 22. Still, despite having stated in the court that they would give their willingness in writing to the university, the petitioners failed to do so till the last date of the counselling. Technically, the claim of the colleges should have ended there. But for reasons best known to the MDU authorities, the university proposed to hold a second counselling for the two colleges mentioned above as late as on January 17 and 18. In the meantime, several other colleges got recognition from the NCTE and approached the university and the high court to include their names in the proposed second counselling. The MDU authorities allowed these colleges to participate in the counselling. Subsequently, admissions were made to a special academic session of the MEd (regular) course as a one-time exception by the university. As per the agenda note, “the whole issue was considered by the vice-chancellor and he has passed the orders in anticipation of the approval of the Academic Council”. The note further states that “the action taken by the vice-chancellor (is) in pursuance of the orders of the honourable high court and thus in anticipation of the approval of the Academic Council”. Sounds fair, but would the authorities concerned care to answer a simple question: Which orders? There is no light at the end of the tunnel for compact florescent lamp (CFL) users wanting to dispose of any non-working bulbs. Lured into replacing regular bulbs with energy-conserving CFLs which were being promoted by the Haryana Power Utilities, the only option before the public is to retain it with them till the government ponders over a scheme for proper disposal. Sources in the Power Utilities said breakage or routine disposal of the lamps was not recommended because the mercury content in such tubes and lamps was hazardous and could go into water. In view of the concern raised for “proper disposal of CFLs ”, the Bureau of Energy Efficiency, running under the aegis of the ministry of power, Government of India, has been given the task of working out a scheme. Experts, however, are of the opinion that the CFLs contain as much mercury as regular tubelights or thermos flasks do. Since the disposal issue is in the still-under-consideration stage and could take about a year, all CFL users are stuck with these for the time being. The Haryana government, too, has gone full throttle to replace regular lighting with CFLs and T-5 lights in all government buildings with an idea to conserve electricity. Initially, the power department had started a scheme wherein for every CFL bought by a consumer, another lamp was given free of cost to encourage its use since power saved was being considered as power generated. The scheme was, however, withdrawn in view of a poor response. Later, the Uttar and Dakshin Haryana Bijli Vitran Nigam launched massive campaigns in their respective areas to convert consumers from energy-wasting incandescent bulbs to energy-saving and long-lasting CFLs. As a part of the campaign, the DHBVN had even provided its consumers with CFLs at low rates from the DHBVN's customer care centres. Under the scheme, customers are being offered 11W, 15 W and 20 W CFLs at the rate of Rs 67.50, Rs 75 and Rs 100 per piece, respectively. T-8-36 W tubes would be offered for Rs 32 per piece. The CFLs, which are an excellent example of energy-efficient technology, can save as much as 80 per cent of electricity used for lighting. About 25 per cent of the total power is being used for lighting in Haryana, which rises to over 40 per cent during evening and morning hours. By using CFLs, the consumption can be reduced by about 70 per cent. Washing their hands of any responsibility to deal with used and fused lamps, which have a life of three to 10 years, power department officials maintain that they are nowhere in the picture since they are only “encouraging” the use of CFLs. “The consumer buys the lamp from the company so we are nobody to take these back. As of now, the public is disposing of the lamps in the fashion it pleases. However, we are coming out with a scheme under which a consumer can take back Rs 5 for every lamp deposited, if and when the scheme comes out,” an official said. Till then, the public will just have to wait and watch, hoping “light” on the disposal of CFLs will dawn soon. An official spokesman here today said the scheme had already been implemented in Sirsa district as a pilot project. Under the scheme, 60 recharge tanks and five water storage tanks were being constructed to improve the water table. He said in each block of Sirsa district, the panchayat land would be identified and 10 recharge tanks would be constructed in each block. He said, according to a scientific report, when 10 lakh litres of rain water or canal water was added to saline water of an area, that water pushed the saline water to the other side and it was replaced with sweet water. The scientists had installed tubewells after conducting such experiments and these tubewells were now pumping out sweet water, he said. A multipurpose field drainage and surplus canal water storage tank would be constructed at a cost of Rs 7.33 lakh at Mangala village of Sirsa district. The tank would be filled with water. Simultaneously, tanks and water channels would be constructed to store rainwater. The cattle in the village would also drink water from this tank and farmers would be able to utilise this water for irrigation by installing pumps. In Mangala village, 24 recharge tanks would be set up over an area of 24 acres. Each tank would cost Rs 20,000. Sources said suspecting the involvement of at least two senior jail functionaries, the prisons headquarters had shot off a letter to the state government on February 15, but nothing had been done in this direction. Following an official complaint, sleuths of the state prisons department raided the jail premises on January 26. During the inspection of the food stock, the team found that 220.28 quintals of wheat was missing from the jail. Jagbir Singh, who has been the jail stock keeper since 2006, had reportedly “admitted” his guilt and also offered to compensate for the embezzled wheat. Interestingly, in a communication to the prisons headquarters, jail superintendent Rajinder Singh Siwach wrote that Jagbir Singh had purchased wheat from the open market and handed it over to the jail administration. Sources said as per the Punjab jail manual, it was the duty of the jail superintendent and the deputy jailor to check the store once in every six months and register their remarks of the food stock. In case of any discrepancy, the state headquarters should be intimated immediately. But in Rohtak jail case, the wheat stock was received from HAFED in May 2007. An examination of the register concerned revealed that the jail superintendent had not verified the stock at the time of purchase or later, a source revealed. Official records confirmed that the deputy jailor had remarked that, “Wheat checked and as per balance found correct.” A top prisons official admitted that such a large quantity could not be taken out without the connivance of jail functionaries. Raising their suspicion over accepting the wheat by the jail officials, officials said it was a matter of investigation that who had arranged the finance of about Rs 2.25 lakh to purchase 220 quintals of wheat. Interestingly, the Gurgaon IT city alone generates the revenue of more than Rs 2 crore monthly through postal services in the city. According to the figures provided by the postal department, the collection through speed post is more than Rs 1 crore. Similarly, collection through financial statement is more than Rs 1 crore every month. Besides, the department also generates revenue from the retail services. But shockingly, to efficiently cater the postal services in the city, the Gurgaon postal department has only a meager staff of 30 personnel. A senior official of the department revealed that there were around 250 clerical employees for the four districts of this division. Out of which about 40 employees on an average remain on leave due to one or the other reason and rest of the 200 employees are handling the postal services in the four divisions. To cater to the work of the two head post offices at Gurgaon and Narnaul, as many as 25 employees at each place had been deployed, he added. He said the employees of the head offices look after the accounts of the branches of the department, compile the data of the revenue collection of branch post offices and also provide services to the public. He said as the workload in the city was increasing manifold due to setting up of many companies, there was a need to increase the staff strength to 45 for the smooth functioning of the post offices. The official said there was 2 per cent cut by the department every year on the employees due to the feeling that the work in this department was decreasing due to availability of other substitutes of the communication. But in the case of Gurgaon, this was totally wrong because no doubt that the usage of first class mail services like mail, inland and postcard has decreased, but the business of second-class, mail like reports of companies, magazine and detail of companies in the city has also increased manifold during the last three years. He said surprisingly there had been no monitoring in the workload and availability of manpower in terms of the post office for the last more than 15 years by the department. Due to these factors, the services of the department are being adversely affected. He further said most of the branches of the post office of the city and even the head offices of the department were facing huge shortage of postmen, which was directly affecting the mail services of the city. He said due to shortage of staff, a number of times even the speed post letters were not delivered on time. Talking to The Tribune, director (postal service) Ashok Kumar said the city was facing many problems, but these would be solved soon as the department had recently sanctioned 30 new posts of postmen, especially for Gurgaon. He said this time preference would be given to young talented people as the department was facing the problem of timely delivery of mails in the city. He said with the recruitment of young staff, postal services in the city would greatly improve. Gurgaon has once again earned the distinction of garnering the maximum revenue from the allotment of liquor shops in Haryana by a draw of lots. Revenue of Rs 124.69 crore was collected through the allotment of 292 liquor shops here today. A senior official said the draw of the shops was undertaken in the district under the new excise policy of the state for the financial year 2008-2009. Out of 292 shops, 159 were for sale of foreign-made liquor, which earned the revenue of Rs 95.29 crore, and the rest, meant for the sale of country-made liquor, earned Rs 32.40 crore. He said revenue of the district had increased by 12.5 per cent as compared to the last year. Last year, 267 shops were allotted by the department, which had earned a revenue of Rs 111 crore. On the application forms for shops, he said this time the department had received 22,800 forms for shops of both foreign-made and country-made liquors whereas last year the number was 17,000. This year the department earned Rs 11 crore from the sale of application forms for shops as compared to Rs 8 crore in the previous year. He revealed that the department received 700 application forms for the liquor shop near signature tower. An official said after the new excise policy, the price of the liquor had declined. The demand for the foreign-made liquor shops was more as compared to the country-made liquor shops because of a large number of MNCs in the district. Deputy excise and taxation commissioner, Gurgaon, Ashok Sharma said this time individual vendors also got a chance to participate in the allotment of shops. The CPM today organised a demonstration against the attack on the party office in Delhi allegedly by activists of the sangh parivar. The CPM activists assembled in the local Ambedkar Park and expressed their resentment over the alleged inaction of the central government on this issue. Addressing the agitating CPM workers, Krishan Swaroop, member of the state secretariat, and Ram Kumar Bahbalpuria, district secretary, said the “well-planned attack” on the office of the party was a threat to democratic and secular forces in the country. They alleged the sangh parivar, particularly the BJP, was scared of the increasing popularity of the CPM and had resorted to undemocratic methods. They said the party activists would not be cowed by the threats of the sangh parivar and continue their fight against fundamentalism. They said hundreds of party workers from this district would participate in the March 18 demonstration of the party in front of Parliament House. The CPM workers also organised a procession in the town and raised slogans against the sangh parivar. CPM leaders Rajesh Mahiya, Joginder Singh, Chhatarpal Singh and Ram Swaroop were among those who participated in the demonstration. The well-known bartan bazar of Jagadhri remained closed today in protest against the increasing incidents of theft in the market. There are more than 200 shops in the market. Shopkeepers accompanied by other traders gathered at the mini secretariat in the morning and raised slogans against the district administration and the police. They said the police had failed to check incidents of theft in the district and thieves were free to strike at will. The traders were angry as thieves had struck at a shop in the main market and taken away brass utensils. Sunder Lal Batra, secretary of the Jagadhri metal manufacturers and suppliers association, demanded that police patrolling should be intensified in the markets. The protesters insisted that they would sit in dharna at the secretariat, but DSP Ram Chander managed to placate them. The traders later reached the Buria police post and held talks with the DSP. A teenager was killed and as many as 31 others were injured when the school bus they were travelling in overturned near the Safidon road bypass here today. The mishap occurred when the bus, which was carrying 45 students, was on its way to the school. The driver fled away after the accident. A case has been registered. The accident that took place at around 8.45 am. The police said the accident occurred when the driver was trying to take a sharp turn near the bypass. The bus crashed against a divider and overturned as the driver ‘failed’ to control the vehicle. The deceased has been identified as Rakesh (15), a student of class IX of Minerva Public School, to which the bus belonged. The victim, who was sitting on a corner seat near the exit door, fell out of the bus as the vehicle overturned. Rakesh, a resident of Dalamwala village, had boarded the bus at around 8 am to go to the school to appear in the annual examinations. The bus was carrying students hailing from rural areas and as many as 14 hailed from Dalamwala village. Four students, who were seriously injured, were shifted to the PGIMS at Rohtak. They have been identified as Aman of Khokri village and Sandeep, Sonu and Sumit from Dalamwala village. The other injured have been identified as Sonu, Naresh, Umesh, Jyoti, Priyanka, Pooja, Gurmeet, Anju, Mohit, Aman, Sonu,Sanjay Ankush, Surya Prakash, Kiran, Vikash and Vishal. All injured were between 6 and15 years of age. The driver, Satyawan, who escaped unhurt, however, managed to slip away from the spot. Meanwhile, in another development, a khap panchayat, which was held at Nandgarh village in the district, declared social boycott of a family, as it failed to repay an amount of Rs 9.45 lakh. The family headed by one Japan Singh had allegedly taken the amount from Dalbir and JaiKaran, residents of the same village, some time ago and had failed to return the money despite the time limit and assurances given in the panchayat held earlier. 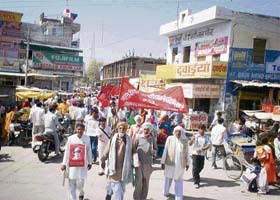 The khap panchayat ordered social boycott after Japan declined to accept the decision of the panchayat regarding the repayment of the money. The police official, Ishwar Singh, a resident of Samaspur Majra village in the district, was going to Delhi with his two children and wife. As soon as they reached near Jahangirpur village around midnight, their car collided head-on with a private bus. Three of them - Ishwar Singh, who was driving the car, 20-year-old son Sandeep and 16-year-old Urvashi - died on the spot while his injured wife Premlata was taken to hospital in Delhi. Some passers-by and labourers residing in a nearby brick-kiln reportedly took the injured woman to the hospital. The police has registered a case against the bus driver, who fled the spot after abandoning the bus. According to information, when the driver of the school bus, after having dropped students at the school, was taking the bus to the parking stand, Neha, who was about to move away, was unnoticeably run over by the bus. The police has booked the bus driver, Krishan Kumar, for rash and negligent driving. Kashmira Singh (40), a resident of Jandwala Jattan village under the the Odhan police station in the district, was killed in cold blood last night by three assailants. According to police sources, an old enmity is reported to be the cause of the crime. On the basis of a complaint filed by the deceased’s son Manga Singh, the police has registered a case of murder under sections 302 and 34 of the IPC against Gurmail Singh, Gurtej Singh and Iqbal Singh, all residents of the same village. In his complaint, he has alleged that the accused attacked his father with sharp as well as blunt weapons and caused grievous injuries on his head and other body parts. They were yesterday produced in the court of the Additional Chief Judicial Magistrate who remanded them to judicial custody. The case of harassment for dowry was registered against three persons on a petition earlier filed by Manoj. Manoj, who got married to Abhey Singh in 2002, complained that her in-laws persistently subjected her to cruelty for dowry. The CBI court today reserved its decision on the bail application of Pooja, wife of Dr Jeevan, an accomplice of the kidney racket kingpin, Dr Amit Kumar, till tomorrow. Pooja, who was lodged in the central jail here after her arrest in the kidney case for alleged complicity in the racket, had moved the court seeking bail since she was pregnant. The counsels for Pooja, R.L. Bhagar and Amit Gupta, pleaded that she should be granted regular bail in view of her state of health. However, the CBI counsel, disagreeing with the defendants, said she should be given interim bail and not the regular one. After hearing the arguments from both sides, the court reserved its decision till tomorrow.